One of the nice features of Docker 1.13 is the rationalisation of their CLI. Now the `docker` arguments are all neatly organised around a common schema making it easier to work out what command you need to use. The benefits of a well thought out CLI are enormous, particularly when automating tasks for CI pipelines or scheduled operations tasks. However the main drawback with textual interfaces like the command-line has always been discoverability. With a GUI the options are there in front of you, or at most hidden behind the click of a mouse on a menu or drop-down list. Sometimes it can feel like you are stuck back in the seventies with the worst of Unix elitism: what do you mean you didn't know that the -B flag can't be used when you set the depth to seven with the -S option, obviously you should have been using -Q 3 to force compatibility mode! Fortunately, modern shells have the answer with tab completion. This is available for most of the built-in commands and usually supported by third party tools via a completion script that is either installed at the same time as the tool or can be downloaded or generated afterwards. So, let's look at improving things for users of Brooklyn and Cloudsoft AMP, with maybe some extra help for a few common container management systems as well. Brooklyn has now been shipping with a command-line interface for the past few releases, written in Go and talking to our REST API. Due to the shared open-source heritage, all Brooklyn commands are also compatible with Cloudsoft AMP so assume that I am referring to both for the rest of this post. Note that the last line was required because this application happened to be running on Docker, so we need to know the correct address to connect over the Internet, not the IP address and port the container is using internally. But as well as this we can add bash auto-completion. This is not yet part of the Brooklyn codebase, and is strictly experimental at present, so the usual caveats apply. In fact, I created this project to learn more about how bash auto-completion technology works, so it is my very first implementation of one. The code is available on GitHub at brooklyncentral/brooklyn-bash-completion and consists of a single file, also named br. The completion script is probably in need of some expert attention, and I would also like to add support for more of the Brooklyn commands, but it is definitely usable and I find it invaluable. I have also discovered that there are some features that could be added to br itself that would make implementing auto-completion much simpler. For instance, options for all the commands that cause it to return unadorned text, such as a list of entity IDs one per line, or being able to pass in Go template strings that would allow formatting lines of output in this way. Looking at the way that tools like kubectl works is instructive here, as it also support this feature and uses it in its completion script. So, there we have it. As mentioned earlier, this was my first attempt at writing a completion helper script, and I think it needs a LOT more work. However, even in the rudimentary state it is in now, it makes my life a lot easier when using Brooklyn, and I hope that by getting more people to use it bugs will be discovered and fixed much faster. I find this a huge time saver when debugging Kubernetes issues. Finally, as we all know, The perfect is the enemy of the good and the br script is definitely not perfect, but I hope this post will encourage someone to take a look at the code, and perhaps move it somewhat closer to good territory... Simply clone the brooklyncental/brooklyn-bash-completion repository and file an issue or create a pull request! Eventually, I even hope that it could even improve to a state where it can be included with the Brooklyn command-line client. At Cloudsoft we have long been fans of the Calico Project from Metaswitch, and the news that it was being spun out into a separate entity, called Tigera was much appreciated. Tigera promptly took ownership of the CoreOS Flannel project, another SDN solution, and announced Canal, which would be a combination of Calico and Flannel, packaged for Kubernetes, Docker and Mesos. All of these products are designed to help you implement networking solutions for modern containerized applications. With this in mind, I was keen to try out Canal and see how it integrated with Kubernetes. At present, however, the Canal repository in GitHub contains the modern equivalent of the Web 1.0 'Under Construction' GIF - a single README.md file. However on the Calico Users Slack channel I was helpfully pointed at a set of instructions on the CoreOS website that described a DIY approach to the problem. At its root, Canal is simply Flannel with VxLAN used for networking between VMs and containers, and Calico is used to manage the network policy. Both projects are available as CNI plugins, and Kubernetes is able to use CNI to configure networking for its pods and their containers. The binaries, and example configuration files, are all available to download, so I set out to create a Kubernetes cluster. If I was going to test the waters using the exact setup and configuration described in the online guide from CoreOS, this would have been a very short article! The happy path just requires you to provision some VMs and follow the instructions. However, I am interested in building something more generic and flexible to use as the basis for an AMP blueprint to run in a production environment, so a little more investigation is required. The first issue I ran into was one of versioning. The world of containers moves quite fast, and yesterdays hot new release is todays legacy cruft. I decided that the sensible thing would be to use the most recent stable release for each component, however the instructions available often used combinations of versions that were now outdated, with the latest releases offering new and incompatible configuration options and flags. Additionally, many of the guides that can be downloaded assume that you will be using exactly the same set of features, add-ons and operating system version. For example, there are many explanations that use Flannel as a stand-alone SDN and many that show how to use Calico on its own, but only the CoreOS instructions explained how to use the two in concert. Of course, the CoreOS team want you to use the rest of their product offerings, so their guide helpfully describes how to deploy using Rocket, rather than Docker, and assumes your VM will be running CoreOS. I was constrained to the fairly outdated CentOS 7 for the machines I would be deploying to, and decided on: Kubernetes 1.3.5; Flannel 0.6.0 (the release of which is in a different format and at a differently configured URL to all other Flannel releases, which caused many problems until it was discovered); Calico 0.21.0; CNI 0.3.0; Calico CNI 1.3.1; and Docker 1.12.1. Several of these components, such as the CNI release, are not mentioned in many guides, often assuming that dependencies will be downloaded via a package manager. However, the Yum repositories are several point releases behind on Kubernetes so this was not an option. But, once the software had been decided on, it was simple enough to download and use. Kubernetes deserves a special note here, since it is offered as a TGZ archive on the GitHub release page. This file is 1.4 GiB in size, however, and when running the scripts inside it, they will in turn re-download the archive, extract it again, and then extract another archive inside it, to obtain the required binaries! A little searching and a review of other Kubernetes install scripts revealed that Google provides an alternative download location, where binaries for each service can be found for most combinations of version, operating system and architecture. Once the correct versions of the services are safely copied to disk on the machines I will be using for my cluster, they must be configured properly. Here again, there are many different ways to accomplish the task. The scripts in many of the online guides give a good start, and usually configure a service file for Systemd that will start the process. First, though, the service files must be deciphered and reviewed to determine what arguments and environment variables are being used to configure the daemon processes. This can be a surprisingly complex job, with some implementations using several layers of indirection, creating environment variables that are used to set other environment variables in an environment file that is read by the actual service file itself. The service definitions often do things that I find unacceptable in a production environment, such as downloading the service binary from a repository during startup. There is also a choice to be made as to the mechanism used to run the services. Often Docker is used to host them, requiring you to rely on another indirection mechanism and set of custom variables for configuration. I decided to create a series of Systemd service files, using my preferred set of arguments as determined from the available examples and the Kubernetes documentation. These were augmented by some supporting code in a script that performed other tasks such saving Flannel configuration to the etcd server and setting some basic iptables rules. This is by no means the end-stage of the process - the configurations and settings are to be used to create a blueprint for a cluster that can be used to run production workloads. For this part of the project, however, I was simply interested in getting Kubernetes up and running with the Canal services providing networking. This final stage proved the most elusive; getting a working Kubernetes cluster is mostly just a case of starting the necessary services and making sure they know where the master API server and the etcd cluster endpoints are. The moving parts and options for networking make it slightly more complex. The concepts involved in Kubernetes networking can also be confusing at first glance. For example, Pods use virtual, non-routable IP addresses that are assigned to application endpoints. These are actually forwarded using a series of iptables rules, but with Kubernetes, Docker and Flannel all wanting to play here, deciphering the applicable rules can be impenetrable. Since Canal only uses the networking policy features of Calico, it is not immediately obvious that you must disable Calico networking when running the calico-node. The setting of the environment variable that achieves this is also hidden away without comment in a startup script. The trek from new VMs to a running Kubernetes cluster with Canal was much longer that it should have been. Obviously there are options such as MiniKube, which allow you to get up and running very quickly, and start testing applications. But it is not a production cluster, nor is it meant to be. Of course, neither are the scripts in the online installation guides or the Kubernetes repository. A production deployment requires more than I have described here, such as TLS security and integration with CA servers, access to local registries for images, resilient management clusters with load-balancing and fail-over, monitoring and log management, and scalability. These are features that the AMP blueprint for Kubernetes will have to provide, using this as a starting point. Kubernetes the Hard Way by Kelsey Hightower. CoreOS + Kubernetes Step By Step from the CoreOS site. Creating a Custom Cluster from Scratch in the Kubernetes documentation. Configuring flannel for container networking in the CoreOS Flannel documentation. Look out for an article on the Cloudsoft blog that will discuss how these configured services were transformed into AMP blueprints as part of the Cloudsoft Container Service. These AMP blueprints can be used to make repeated and reproducible production Kubernetes cluster deployments with Canal, and AMP can then be used to deploy your own applications there. Peter at Project Calico has already described some of the cool things that Calico can do to link Virtual Machines and Docker Containers using Software-Defined Networking. Here I want to show how some of the new features in Clocker can use Calico to orchestrate the deployment of applications that span both platforms. To make this work, we will need the latest version of Clocker, which is the 1.0.0 technology preview, currently available for testing. There are several new and updated features in this release. The major points are listed below, but we will concentrate on how to link OpenStack Virtual Machines and Docker Containers in this post. The ability to start Calico with an external etcd cluster, using local proxies on each Docker host. Support for Swarm as the entry point for the cluster of Docker hosts. An OpenStack aware virtual network entity for mixed-infrastructure applications. Configurable setting to switch off sshd installation and use docker exec instead of ssh. Change from Ubuntu base image to use Alpine for faster container startup times. Once we have our Calico Docker and OpenStack Cloud running, we can deploy applications there, in the same way that we would deploy applications to a standalone Docker Cloud. These applications will consist of containers connected to Calico networks, and will only be able to connect to services running on Virtual Machines in the OpenStack cloud through the Internet. For private communication between VMs and Containers to take place on a Calico network, we must write a blueprint that describes this. Calico connects containers together by adding them to a profile on Docker. Calico also create profiles on OpenStack when a security group is created, so we must ensure that our application has a way to link the security group name used on OpenStack to the profile name needed on Docker. We do this with a new VirtualNetwork sub-class which creates a new security group in OpenStack. The UUID of this new security group is then used by Calico as a profile name for Docker Containers. We have created a simple demo application to illustrate linking Docker and OpenStack with Calico. This consists of a Riak cluster running on Virtual Machines in OpenStack, and a cluster of Node.js applications, fronted by an HAProxy load balancer, all running in Docker Containers. The Clocker blueprint for this application needs to describe the OpenStack location where we will create a RiakCluster entity with several RiakNode children. These will use VMs in a security group, created by the OpenStackVirtualNetwork entity. Finally, we will create a ControlledDynamicWebAppCluster which is a load-balanced group of web services, each of which will be a NodeJsWebAppService running some client code that access Riak to update a simple counter and display it on a web page. The complete YAML blueprint is shown below, and the application can be found at csabapalfi/riak-counters-example. name: "Riak and Node.js Demo Application"
There are a few things to note about this blueprint. Firstly, the OpenStackVirtualNetwork is created with the name data, and this network is used by both the RiakNode and the NodeJsWebAppService entities. The second network refernced is named web and is also used by the Node.js entities, as well as the HAProxyController which is acting as a load balancer. The second network will be created by Clocker automatically, without the need for any explicit entity definition, using its default settings and will be used only with Docker Containers. The specification for the controller entity for the web cluster uses a Brooklyn entity, the HAProxyController, but Clocker can simply use a pre-existing image from Docker Hub (in this case haproxy:1.5.9) and will reconfigure it appropriately when new web services are added to the controlled group. A similar method could have been used with the Node.js entity, if desired, and in many cases when a blueprint will only be used in a Clocker context this is desirable. The running application displays a counter and a unique identifier for each Node.js server connected. The number of these services can be increased either automatically with a Brooklyn policy when scaling criteria are met, or manually by invoking the resize effector on the cluster. To learn more about how to write and run Brooklyn and Clocker blueprints, look at the this introduction or more in-depth documentation about creating YAML. Clocker is available on GitHub under the Apache 2.0 license. You can provide feedback with any comments or problems on the incubator-brooklyn-dev mailing list, or add issues to the GitHub repository. If you have an idea for an improvement or a new feature, just fork the code and issue a pull request! See the Trello board for the current roadmap and task list. It's been a long time since the last update to Clocker, at least in the fast-moving world of Docker. Since then we have had multiple releases of the Docker Engine, now at version 1.5.0, and the announcement of beta releases of the Compose, Swarm and Machine tools, Socketplane.io joined Docker, competing container software has appeared, like Rocket from CoreOS, and there have been several new minimalist, Docker-specific operating systems and distributions annouced. So far, Clocker has caught up to the latest Docker release, and supports some of its new features, and we are working on adding support for Compose and Swarm. As it stands, Machine is not as useful for Clocker, since we leverage the powerful jclouds library and the mechanisms provided by Brooklyn for VM creation and deployment. The most exciting integration is going to be using the Compose language as a blueprint for Clocker, allowing re-use of existing application definitions. The main feature of 0.8.0 is the pluggable Software-Defined Networking capability. In the previous releases it was possible to enable Weave as a SDN mechanism that provided networking between containers on different hosts. In this release I have made the SDN provider a generic interface and written multiple implementations, porting the original Weave code across to work this way also. The latest SDN provider is the Project Calico for Docker, from Metaswitch, which will be merged into the code later this week. 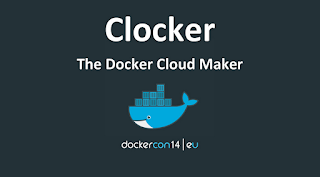 I am very excited about this integration, as it shows that Clocker can be used to orchestrate Docker CLouds in various configurations with whatever choice of features is optimal. This opens the way for further integrations like Flocker from ClusterHQ for storage, using their Powerstrip extension prototyping mechanism. This release of Clocker is a developer preview or early-access release of 0.8.0 which will be available until the final 0.8.0 is shipped. Since the development for 0.8.0 was dependent on a SNAPSHOT release of jclouds it was carried out on a feature branch, and was less visible. I have now merged that code with master and made customised releases of both jclouds and Brooklyn available, thanks to Cloudsoft, on their Artifactory server. This means it will be possible to clone and build the latest code and test the SDN features I have been building. I would appreciate any comments about usability and any bugs found, and will try and incorporate them into the final release. Over the next week I will work through the outstanding issues and tasks, particularly finalising the Project Calico integration, and generally improve the quality of the released code. To test the code, use the following commands to download and run a Docker Cloud with weave networking in SoftLayer. You may need to configure your credentials for the Brooklyn location first. If you don't have a SoftLayer account, any cloud supported by Apache jclouds is suitable. Remember to send any bug reports or feedback on this pre-release to clocker@cloudsoft.io or create an issue on GitHub, and I will investigate. One of the things that has kept me busy recently is speaking about Clocker, and you can view the slides from a couple of these presentations online. 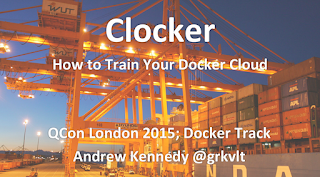 At DockerCon in Amsterdam I gave an overview of Clocker and its Weave integration, then this month in London I spoke during the Docker track at QCon. There I explained more about the ways that Clocker can create a Docker Cloud and optimise its deployment to fit your specific needs. The slides are linked to below, and there is a longer list on the Clocker Wiki. I will link to the video of the QCon talk when it is available. I will also be speaking at ApacheCon North America about Clocker, as well as my colleagues Andrea Turli and Alex Heneveld, so please come along if you are attending. The dates for your diary are listed below. One of the features of Apache Brooklyn is the ability to retrieve data from a running entity using sensors. These sensors expose data from the entity as attributes containing information like queue depth for a message broker, latency for an HTTP server or CPU usage for a Docker host. The data can also be enriched or aggregated to produce sums or moving averages across multiple entities in a cluster, and used as input to policies to drive scaling and resilience mechanisms. The sources for these sensors are varied, and encompass JMX attributes for Java applications, fields from XML or JSON documents returned by RESTful APIs, parsed output from shell commands and many more. Sometimes the entities provided by Brooklyn do not have the particular piece of data you need for a policy exposed as a sensor. In these circumstances it is possible to dynamically add sensors, either programmatically in a Java entity class that extends the default Brooklyn code, or in the YAML blueprint used to describe the application. There are three different categories of sensor that can be added, SSH command output, JSON data from an HTTP URL or JMX attributes from a Java entity. each of these are configured differently, although there is some commonality. First, we will look at an example using the SshCommandSensor class to add sensors driven by the output of shell commands invoked over SSH to the virtual machine running the software process being managed. The following blueprint shows a TomcatServer entity and a brooklyn.initializers section adding a sensor to it. command: "mpstat | grep all"
pre.install.command: "sudo apt-get install -y sysstat"
The output of this sensor can be seen in the following screenshot. The SSH command mpstat | grep all is being executed to generate information on CPU usage, which is the published as the tomcat.cpustats sensor. However when trying to perform some calculations on the data from mpstat, using the following YAML fragment to add another sensor, my colleague Richard discovered that the code did not perform as expected. Although the SSH commands appeared to be being executed as expected, the sensor data was always empty. The problem is that the LANG environment variable is different between me running SSH in a terminal to test out potential commands, and when Brooklyn is opening SSH sessions to run its commands. Notice that the date has changed from 24-hour form, to 12-hour with AM/PM suffix. Also note that there is a space before the "PM" suffix - causing all of my awk field numbers to now be off-by-one. D'oh! So if the output of a command you intend to use with awk, perl or even just cut includes potentially locale-specific items, explicitly set the LANG variable to prevent any surprises in formatting that will throw off your parsing routines. In this case, modifying the command value in the blueprint to set the locale explicitly is achieved by setting LANG to en_US.UTF-8 in the blueprint. Other examples of SSH sensors might be returning the contents of various files in /proc or executing an administration command for an entity to return information. The sensor can be configured to poll at specific intervals, and the output can be coerced to different types, as required. To chnage the poll frequency, set the period configuration key to the time required, either in milliseconds or using a suffix to indicate minutes or seconds, for example 10m for ten minutes or 5s for five seconds. The sensor type is set using the type configuration key, and can be either the name of a primitive type or a fully qualified Java class name. The following example returns the available disk space as the disk.available integer sensor, every five minutes. command: "df / | grep disk1 | cut -d\  -f4"
The dynamic sensor addition in Brooklyn is not limited to running SSH commands, and there are currently two other mechanisms available. If you have an entity that is running a Java program with JMX enabled, Brooklyn is able to retrieve attributes and convert them into sensor data. Using the JmxAttributeSensor in the same way as for SSH sensors, we can add a dynamic JMX sensor. For example, this YAML snippet adds the LoadedClassCount attribute from the java.lang:type=ClassLoading JMX object as the loaded.classes sensor, refresing every thirty seconds. This JMX object is part of the JVM management information beans, and should be available on every Java application. To access application specific attributes, Brooklyn must already be able to access JMX data on the entity, which will normally be the case if the entity implements the UsesJmx interface. This means that Brooklyn will be able to determine the JMX and RMI or JMXMP ports that are being used, as well as any authentication details that are required, and these are re-used when adding sensors like this. The same period and type keys are used to configure the sensor polling and return value coercion, just as for SSH sensors. Finally, it is possible to access and parse JSON data froman HTTP based REST API on an entity. This uses the JSONPath expression language to extract parts of a JSON document, which are then returned as the sensor data. An example of the YAML required is shown below. Again, name, period and type have the same meanings as for the other sensor types. The uri key configures the endpoint to access with optional username and password credentials (in future a map of HTTP headers and other features will be added.) If a status of 200 is resturned, the content will be assumed to be a JSON document, and the jsonPath key is used to extract some part of the data as the sensor value. Here we are simply retrieving the value of the sensor field, but it is possible to perform much more sophisticated queries, although this is beyond the scope of this post. To give a (contrived) example of how dynamic sensors might be used in an application, imagine that you have a cluster of Couchbase nodes that you wish to scale. Unfortunately the current Brooklyn blueprint already exposes all the useful sensor data you might practically need to use when resizing the cluster, so we must turn to imparctical and useless data instead. Imagine you need to resize based on the amount of disk space used, and ignore for the moment that this is not the right way to scale a cluster. The following blueprint is intended to illustrate the ways in which dynamic sensor data can be used as the input to a policy. The following JSON fragment is part of the data returned by a REST call to the /pool/default endpoint which returns cluster details. We are interested in the usedByData entry, showing hard disk space used by data. The blueprint below shows how an AutoScalerPolicy might be configured to use this information. We have created a new couchbase.storageTotals.usedByData sensor, which connects to the cluster REST API enpoint specified by the uri, username and password. This returns the pool information and the jsonPath selector extracts the $.storageTotals.hdd.usedBydata path which is coerced to an integer based on the type configuration. The scaling policy uses a $brooklyn:sensor(...) directive to configure its metric key, this looks up our dynamic sensor which will then be compared to the lower and upper bounds to decide whether to resize the cluster. This pattern can obviously be used in your own blueprints to much more useful effect! Hopefully these examples have given you an idea of the capabilities available when designing Brooklyn blueprints. The aim of Brooklyn is to simplify the autonomic management of applications in the cloud, so the ability to build blueprints from pre-defined components and then extend them without needing to write code is core. It is never possible to anticipate every piece of information that users might need to use in their business logic while building policies for elasticity, scaling or resilence. 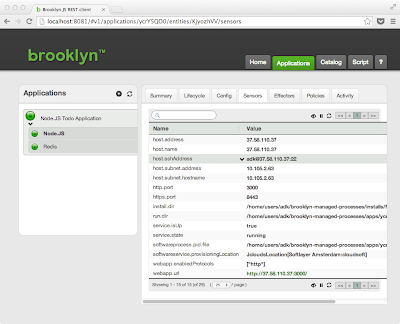 When creating a blueprint for an application, you can dynamically add sensors to retrieve information from entities using SSH, JMX or HTTP, and wire those sensors into Brooklyn's policy framework. More detailed documentation is available, and further information can be found at the main Apache Brooklyn site or on GitHub. One of the things that Clocker is designed to accomplish is to make multi-host Docker networking as easy as using single-host Docker. The way we do this currently is by using the Weave project. Weave is very interesting, because it is an entirely user-space software defined network, and is incredibly simple. Because Clocker is trying to make Docker Cloud applications easy to use and orchestrate, we found Weave a great match for us, with just the right feature-set to allow applications with more complex networking requirements to run in a Clocker provisioned environment without modification. Weave fulfils the essential requirements of a sort of Minimum Viable Network for Docker, and hence Clocker, but still leaving room for other projects to provide segmentation, external endpoints and gateways, and deeper integration. For example Riak uses Erlang and requires epmd (the Erlang port mapper daemon) for clustering, and this uses up to a thousand TCP ports which are controlled by epmd and used simply for inter-node communication. It makes no sense to use the Docker port mapping facilities to expose these ports externally, and there is no reason for any application outside the Riak cluster to have to access them. All a Riak cluster needs to expose is a single port for web client access, and for admin console access. Weave allows Clocker to set up the Riak nodes in containers, each of which is attached to a private LAN, and exposes the Docker port forwarded web client and admin ports only. This was demonstrated at RICON recently, the Running Riak in a Docker Cloud using Apache Brooklyn talk showed a demonstration of a multi-node Riak cluster running in Clocker. Weave is, in essence, a software ethernet switch. As mentioned earlier, it is entirely user-space, which is very important for ease of use in the cloud. 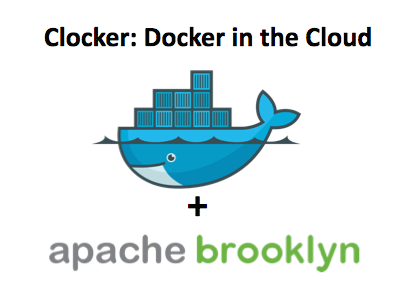 Clocker, and the underlying Brooklyn control plane, is cloud-agnostic, due to our use of the Apache jclouds library. This means we try to design application blueprints in such a way that they will run anywhere. More complex SDN solutions will require drivers loaded into the kernel, and specific images used for particular operating system versions, which requires customising the configuration of each virtual machine on each cloud provider that a blueprint is required to run on. Weave allows us to ignore this and simply start the weave router in a container on each Docker host, Clocker then assigns IP addresses from the link-local address space range to each container it provisions, attaching each one to the same LAN. This is a flat network architecture, and in many ways is not suitable for production use, particularly with multi-tenant deployments where separation of traffic between applications is a concern. A simple type of access control is possible with Clocker and Weave, in the form of iptables firewall rules, since Clocker controls the IP address space used by each application, it can erect firewall rules preventing traffic from crossing application boundaries. So, this simplicity and portability has allowed Clocker to quickly demonstrate the feasibility of multi-host Docker deployments in the cloud. But, in the future, Clocker users will want to deploy more complex applications with networking requirements that are not achievable with the Weave network model. To make this transition as seamless as possible, we need a way of supporting more traditional SDN services, such as OVS. There has been a lot of discussion in the Docker community about ways of achieving this, and how to ensure that the chosen solution fits The Docker Way and maintains the flexibility and openness that has been a hallmark of Docker from the start. The proposals in issues #8951 and #8997 discuss adding a new networking API which will allow plugins for various different SDN solutions to be integrated with Docker. In particular, issue #8997 seems to offer the flexibility and choice that Clocker would need, allowing a simple out-of-box experience with Weave, leading to more complex production deployments with OVS or other SDN solutions, when the environment is under the complete control of the blueprint. The Docker ecosystem is an amazing collection of projects, Clocker and Weave are just a small part of this. One of the features of this ecosystem is the ability to experiment and innovate quickly - many projects, mine included, are permanently in beta, and new features are constantly being added. I hope that the networking and orchestration APIs being added to Docker will maintain this policy and continue to allow small projects to fill their specialised niches in this space. Further information on Clocker can be found at the main Clocker site or on GitHub. This post describes a new feature added to Apache Brooklyn in a recent pull request. The feature was based in part on user requirements and partly to support some work being done with Clocker placement strategies. Previously, to create an object for use by a Brooklyn Entity there had to be a specific piece of syntax in the DSL, with associated code to instantiate that type of object or the blueprint had to be written in Java. There was a mix of complex type coercions from String to various classes, such as the ProxySslConfig class for Nginx, which were not extensible or re-useable, and DSL methods like $brooklyn:entity("id") to reference specific types of object. The code in pull request #182 adds another DSL method that can create and inject any object required into a Brooklyn blueprint. This means any Java DTO, whether defined as part of the Brooklyn code or externally in some library and passed on to a running entity. Additionally it extends the ConfigKey typed configuration mechanism to allow arbitrary objects to use the same configuration definition and documentation classes as entities, policies, enrichers and locations. This makes Brooklyn much more consistent and blueprints much easier to create and much more powerful as well! The new DSL method is named object and is invoked using the $brooklyn: prefix as $brooklyn:object: followed by a map of arguments. It can be used anywhere this syntax is valid, including in its own argument map, and it is possible to create nested trees of objects in this way. The method recognises three keys in the map of arguments it is passed: the object type, and either a map of fields or a map of configuration keys. Any left over and unmatched keys here, or in the field and configuration maps will be ignored. The following example shows how the DSL method could be used to instantiate a brooklyn.example.TestObject object, which is to be configured using Brooklyn ConfigKeys. Note that one of the keys, connectionProperties, is itself an object definition, this time of a com.example.ConnectionProperties object, which could be part of the configuration for a database client. Here, the hostname field of this object is being set using the attributeWhenReady method on a referenced entity, to resolve the host.name sensor value. This shows the complex assemblages of objects and configuration that can be created using the Brooklyn CAMP blueprint DSL. This section documents the configuration used to create an object with the Brooklyn CAMP DSL, describing each of the required values. First the class name used to instantiate the object must be set. This can be done using any of the keys type, objectType or object_type. The value should be a string with the full package and class name of the required object. Brooklyn will use its default classpath for resolution of the class name, looking in the lib/brooklyn, lib/patch and lib/dropins directories. Extra catalog classpath entries, versioning and OSGi will be supported at a later date. Any class on the classpath can be used, as long as it has a public zero-argument constructor. The object.fields key is used to specify a map of fields to set on the new object. These are processed using the Apache Commons BeanUtils project, and should consist of keys representing the field name (which should be accessible via a public setter using the JavaBean conventions) and an appropriate value to set. As noted earlier, the value could be another object construction, any supported YAML primitive value or another DSL method such as an entity or sensor reference, or a deferred attribute access. The deferred accessors will be created as Tasks and resolved at runtime as the blueprint application is started. Finally, brooklyn.config can also be specified with another map of data. This is used in the same way as an entitySpec definition, and will attempt to set fields annotated with @SetFromFlag using reflection. Any keys matching ConfigKeys defined on the object will be set, using the name of the ConfigKey or any @SetFromFlag annotation on them. This assumes that the object implements the Configurable interface, and will be ignored if it does not, as they will cause setConfig(key, value) to be called for each matched map entry. To make this easy to use, a new BasicConfigurableObject class is available, which can be extended and appropriate ConfigKeys added, which will be accessible through its getConfig(key) method. Again, any DSL method or deferred attribute access can be set as a value for a key, and will be parsed and resolved appropriately. Another feature, not available with the object.fields map, is type coercion using the TypeCoercions.coerce(object, class) method, which will be called when setting or accessing ConfigKey values. If the ManagementContextInjectable interface is implemented by the class specified for the object, the DSL will also detect this, and call the injectManagementContext(context) method after construction. Any other object initialisation is left to the user, although possible use cases such as auto detection of init() methods or annotation driven construction are future possibilities. Here is another example of a YAML blueprint, this time describing a Clocker application configuration. We are using the new object creation methods to set up some placement strategies. Lines 6-13 are highlighted, and show how both the object.fields and brooklyn.config keys can be used together to give more flexibility configuring an object. Previously blueprints using YAML were restricted to using pre-defined classes with fixed configuration, now it is possible to define a JcloudsLocationCustomizer that is dynamically configurable per blueprint. The placement strategy example given earlier also shows how much more flexible this approach is. Entities that use MapConfigKey<Object> to store a map of configuration data, where some values are references to other DSL objects, can now use the more obvious ConfigKey<Map<String,Object>> instead, because resolution of DSL objects now occurs on any collection typed ConfigKey. However, a map of data will discard all type information, and prevent you from taking advantage of some of the more interesting and powerful Brooklyn type coercions. Also, all maps are rendered the same way in the console, which may not be very useful or friendly. Using the $brooklyn:object syntax and defining a POJO data holder object can give strong typing for individual data items, and will allow a custom RendererHint to be provided for the specific Java type you define, which can display more useful information in the console UI. I was discussing some issues that Scottish independence may have for high tech startups recently, and two key points were raised that are relevant, and I felt required answering. Scottish technology companies currently rely heavily on various tax schemes from the UK HMRC and their continuity or otherwise under an independent Scotland will have a huge impact on small startups. The result of these decisions will affect everyone working in Scotland's technology sector, including my employer and the many other companies in Codebase, which is the largest technology incubator in Scotland. I think it is essential to have all of the facts available to help shape any decision making process for the eighteenth. Accordingly, I have tried to determine what the proposed status of these schemes would be in an independent Scotland, as well as how long these schemes might be offered for before being changed. In the UK, these schemes have been running for some time; EIS from 1994, SEIS from 2012 and R&D tax credits from 2000. The exact details are assessed and adjusted each year in the UK Budget by the Chancellor, and although they could be withdrawn at any time so far the changes have been positive. The Enterprise Investment Scheme or EIS is designed to help smaller, higher-risk trading companies to raise finance by offering a range of tax reliefs to investors who purchase new shares in those companies. Many venture capital firms and funds or investment companies rely on this as an integral part of their business, such as Par Equity and their Par Syndicate EIS Fund. The Seed Enterprise Investment Scheme (SEIS) scheme complements EIS and is designed to help small, early-stage companies to raise equity finance by offering a range of tax reliefs to individual investors who purchase new shares in those companies. SEIS is intended to recognise the particular difficulties which very early stage companies face in attracting investment, by offering tax relief at a higher rate than that offered by the existing EIS. The rules have been designed to mirror those of EIS as it is anticipated that companies may want to go on to use EIS after an initial investment under SEIS. The Scotland's Future document has a Q&A section with a series of questions relating to Entrepreneurs and the Self Employed. This mentions Seed EIS status after independence in question 68 which states that it will continue. The answers to questions 69 and 70 on venture capital and research commercialisation are also relevant. Would the UK Seed Enterprise Investment Scheme continue? Yes. The current Scottish Government proposes that this scheme will continue on independence. Future decisions on the Seed Enterprise Investment Scheme will be made by the Government of an independent Scotland. Note however, that this is not EIS, which is the major tax break for high net worth individuals, such as angel investors. There is also no information about how long SEIS is guaranteed to be available for in Scotland. It should be noted that the generous tax relief given to individuals who invest in small early stage businesses via EIS and SEIS is for UK income and capital gains taxes and in an independent Scotland the equivalent schemes would apply to Scottish taxes only which immediately reduces the investor base to that of Scottish high net worth individuals. Research and Development TaxCredit is a mechanism allowing companies to reduce their tax bill or claim payable cash credits based on R&D expenditure. Any company carrying out R&D is likely to qualify and it can be an integral part of the finances of many startups, which are often struggling for cash, and any technology company that is doing innovative work should be claiming this. In this article from an accounting website, John Swinney MSP is quoted as saying that the Scottish government will extend and focus research and development tax relief in the event of a Yes vote. Note that there is no information about how long the R&D tax relief is guaranteed to be available for in Scotland. 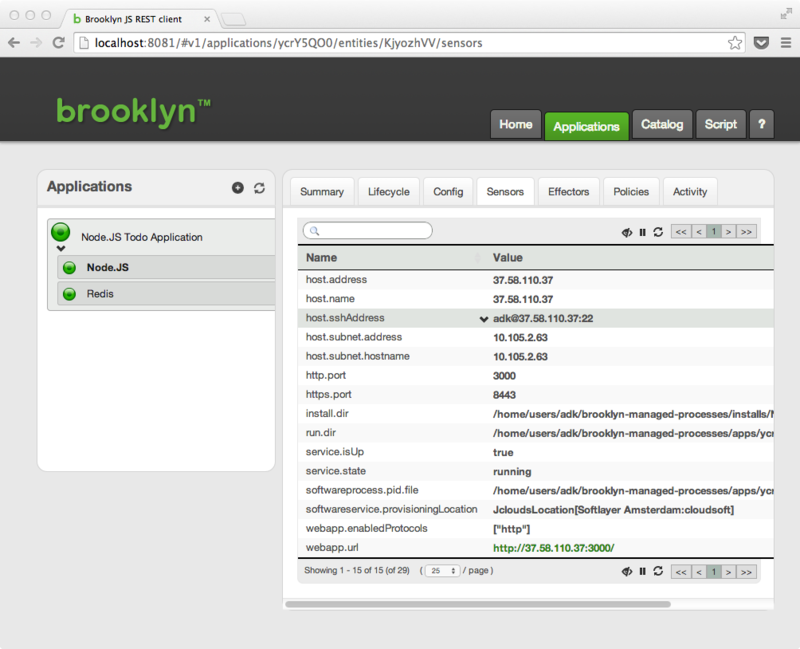 This post shows how Apache Brooklyn can be used to deploy and manage Node.JS applications. This feature was requested in JIRA issue BROOKLYN-12 and implemented in pull request #94. So, to deploy this application in Brooklyn, we need to create a Node.JS service, running the code from the GitHub repository. This will need to be configured with the required dependencies, which should be installed by npm. Since the application uses Redis, we will also need a RedisStore node, and some way of telling the app to connect to it. Fortunately, the application has been written to use Heroku's Redis To Go add-on. We just set the REDISTOGO_URL environment variable to the URL of our store, using the host and port sensors from the entity. Due to changes in the latest Express release I have had to modify the application code in my fork because of deprecated dependencies. This also affects the list of dependencies to be installed by npm, and these are listed in the nodePackages configuration. This blueprint file is available in the Brooklyn repository, in the examples/simple-web-cluster project as nodejs-todo.yaml. As you can see, it defines two services - RedisStore and NodeJsWebAppService. The Node.JS service is configured with the gitRepoUrl pointing to the forked repository with the application code, and the appFileName is used to set the filename passed to the node command to start the application. The env configuration sets the location of the store. This is done using attributeWhenReady calls to retrieve the required sensor values from the Redis entity when they are available. Finally, we use launch.latch to make the Node.JS service wait until Redis has started before actually launching the application. To deploy the application, just paste the YAML blueprint into the YAML tab of the Create Application window in the Brooklyn console UI. We use Softlayer as the target location in this example, but you can use any configured location, as described in the Getting Started guide. Once the machines have been provisioned and the entities have started up, you should see something similar to the screenshot above. To access the application itself, open the link given in the webapp.url sensor. You should see a Todo Redis page, like the screenshot below. To deploy your own Node.JS applications, use the YAML blueprint as a guide, and modify the configuration as required. You can also view the source code for the NodeJsWebAppService entity, to see the rest of the available configuration keys. More detailed documentation is available, and further information can be found at the main Brooklyn site or on GitHub. ADDENDUM These YAML blueprints will also run on Clocker giving you a simple way of containerizing your application. If you modify the locations list to point at the name of an already running Docker Cloud, for example my-docker-cloud then the Node.JS and Redis services will each start in their own Docker containers. The REDISTOGO_URL will need to be changed to use the forwarded Docker port instead, so replace the configuration for the env entry with the following snipped. To find out more about Clocker, see my earlier post Implementing a Docker Cloud with Apache Brooklyn here, or Creating a Docker Cloud with Apache Brooklyn at Cloudsoft. There is also an excellent Getting Started video from Andrea. We have just released another update to the Clocker project, bringing it to version 0.5.0. Clocker is a set of entities and locations for Apache Brooklyn that simplifies deployment and management of Docker in the Cloud. Improved support for more clouds and operating systems. Affinity rules for placement of containers based on currently deployed entities. Support for Docker volume mapping and export. Container CPU and memory configuration. I will also be publishing a tutorial showing how to build a Brooklyn blueprint that takes advantage of these features. This will be a Solr indexing application with a web front-end running on Clocker provisioned containers, with affinity rules and Brooklyn policies to manage placement and scaling. Look out for this in the next few days. In the meantime, there is a slide deck available from the talk that I gave at the Edinburgh Docker Meetup last week, which can be downloaded below. You can provide feedback with any comments or problems on the incubator-brooklyn-dev mailing list, or add issues to the GitHub repository. If you have an idea for an improvement or a new feature, just fork the code and issue a pull request!